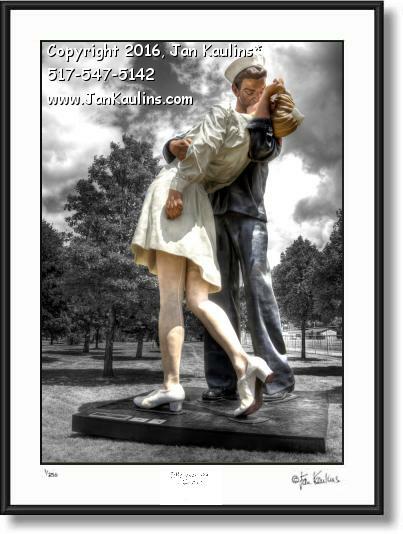 EMBRACING PEACE 'The Kiss' sculpture Royal Oak photo picture art photo print for sale. Royal Oak "THE KISS" Embracing Peace VJ Day photo art prints photography for sale of EMBRACING PEACE Memorial Park sculpture photo prints picture for sale. This 25 foot tall beautiful sculpture of a US Sailor kissing a Nurse by Seward Johnson commemorates VJ Day, August 14, 1945---the day that the world learned that Japan had surrendered and World War II was over. The sculpture was made as an homage to the famous photo taken in New York Times Square on that day by noted photographer Alfred Eisenstadt. This magnificent EMBRACING PEACE sculpture is on loan for six months to help raise funds for a permanent WWII Legacy Memorial at Memorial Park in Royal Oak, MI. This 25 foot tall sculpture is as tall as many of the trees that surround it in Royal Oak Memorial Park. As you can see the entire background has been desaturated of color. After being in the Royal Oak Memorial Park for six months, this EMBRACING PEACE sculpture was removed and shipped on a semi-truck to its new temporary location in Key West Florida. This is a great historical photo now that the sculpture is gone.